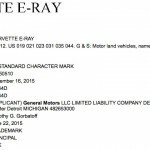 General Motors has filed two applications to register “Corvette E-Ray” and “E-Ray” as trademarks with the United States Patent and Trademark Office. 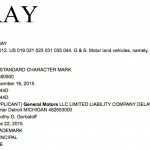 The automaker’s December 16th, 2015 applications specify that the marks will be used to name goods and services in the category of “motor land vehicles, namely, automobiles”. If nothing else, these applications appear to be indicators that the Corvette will get an electrified or hybrid variant. The possibility is interesting, but come off as disconcerting to those Corvette enthusiasts who consider it borderline treasonous to the Corvette brand, nameplate, and spirit for any kind of powertrain except for a monstrous V8 to be found under the hood of a Corvette. Stay tuned to GM Authority as we follow this story, as well as for other GM news. 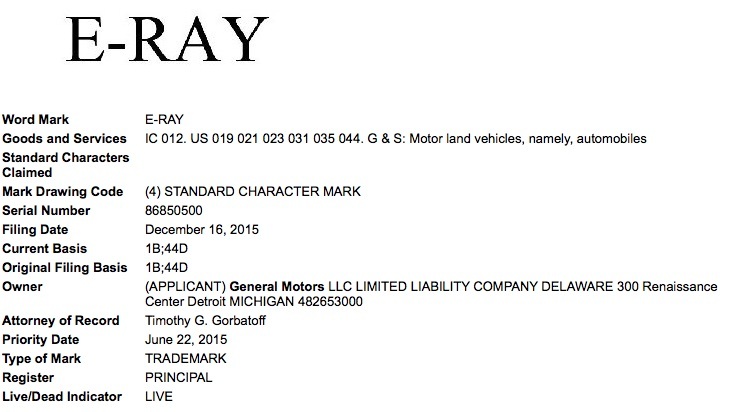 With manta ray, and Zora also trademarked it looks like the corvette family is about to get much bigger and healthier. The name corvette is a strong enough sub brand that it can support a few models IMO. Cayenne is Cadillac’s territory… a hunch tells me you may have meant Cayman. Nope. Porsche diluted itself for profitability (not that I blame them – sell 100000 Cayenne’s to justify a low volume GT3/GT2), just like creating a Corvette brand (or sub-brand) could do. GM did it with slapping the SS badge on everything 10 years ago, and has done it again with Denali. Ah. I didn’t get the sarcasm. Makes sense to me! Corvette crossover 😉 that will be the day. Though not completely out of the realm of possibility. Definitely not out of the realm of possibility in todays hyper-hot crossover craze. I sure hope not though. I see your sarcasm now lol, when I meant grow the lineup I did not at all mean a SUV. I can see the car line up growing with keeping them all coupes of course.. Given the performance of Tesla’s S P90D with Ludicrous mode; but range is still a big issue with all electric vehicles although a gasoline fuel cell electric Corvette would solve this as it tank up by going to a gas station and still be zero emissions. Don’t Gasoline fuel cells still run at temperatures 100-200 degrees hotter than the self cleaning setting on your oven? I think it’ll be a long time before we see them in cars. We might not be able to afford gasoline by that time. Well my HO race set did not have v8s! I was just talking to someone about putting new bodies on base electric vehicles. I must have been speaking too soon…camaro next? Politically correct or not, an all-electric Corvette could have some serious performance. Just have a look at the Tesla S P90D. An American answer to the i8? The i8 answer should be a Cadillac version only. E-Ray, an all electric Corvette! No gas used at all. Corvette carries more cache than any other American name plate. Expanding to several performance models and distancing from Chevrolet sounds good to me. Am I excited by this prospect? Not in anyway but this is bigger than any of use. This is not Politically correct BS as MFG only wish it was. The fact is 54 MPG CAFE is coming and it is going to be damn near impossible to meet with out electronics. I just read a story with an interview of a Past GM engineer, marketing. and Motorsport lead at Pontiac Fred Simmons. He and I have heard others that have been real gear heads admit that Electrics and Hybrids are going to be a way of life like it or not. Some are even saying that the ICE may be on the way out just because of present and future regulations. This is a real issue and a real problem facing the MFG’s. No model even the Corvette will be immune. As we have seen the 918 Porsche has proven a legitimate supercar can be made with this new technology. That car is freaking amazing. Now that it has been a proof of concept the real issue now is to make it even better and CHEAPER. This announcement is no surprise and I had been expecting it. I do expect the Vette team to do something like a 918 like hybrid system that will incorporate many new thing s but at a lower cost. Word I have heard is the new C8 had been tested over 1,000 HP but they had trouble putting the power to the ground. Now the details of this are not clear so I can not say what all is involved but I would not be surprised to see a Hybrid system involved here. The C8 Mid Engine would be the perfect platform introduce this in for now and then lower the cost and spread it out as time goes. I would not be surprised to see this also use AWD. With a Hybrid it would be easier to package this in a mid engine. The major issues I see it the car will still be expensive, the repairs more difficult and while the aftermarket will react to it it will take time to learn how to deal with it. The one thing for sure is the cars will be as fast or faster than what we have now. But we will give up some things like simple mods and I expect higher prices to be paid to buy the cars. We may not have a choice at this point. You are correct as the option for the future are going to be more limited and new ways need to be worked out. We are not going to be out of oil any time soon and the emissions are now better than ever but regulations are changing everything as we know it. Even die hard company enthusiast are now to a point they know change is inevitable. That is what really has caught my attention. Doesn’t mean GM is going to build an electric Corvette. Just means they’re protecting their options, and preventing someone else from registering the name. 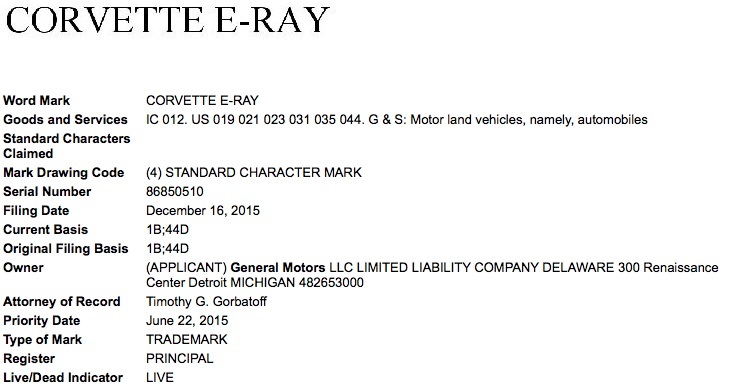 An e-ray mght be made someday, or never, but this certainly doesn’t mean Chevy has made that decision. Chevy could also be interested in building an American LeFerrari mixing high performance with high fuel economy as even with a smallish hybrid module could achieve mid-40 or better mileage very easily. It is an alternative fuel from the oceans. It will be an electric V8. Powered by 8 Electric eels. It will be fueled by salt water. I have seen photos that NASA does not want released. These photos show the planet covered with salt water. It is estimated there are 400 million cubic miles of the stuff. The C8 Corvette E-Ray will be the PHEV variant of the Zora and the segment competitor to the Porsche 918. Look for…..
TT LT8 mid-engined hybrid producing 810hp with a dwc. this vehicle is currently under development. Make mine a LaFerrari ripoff and I’ll die a happy man!